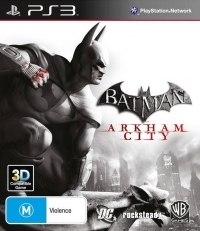 07-15-2014 GAim4A Description Batman: Arkham City is the sequel to Batman: Arkham Asylum and once again stars the masked superhero Batman as the protagonist. The game takes place a year and a half after the events of the original game. After Joker was stopped from taking over the asylum, the asylum's former warden Quincy Sharp claims the responsibility for having averted disaster and he uses the popularity to become mayor of Gotham City. To suppress crime further, an enormous open-air prison called Arkham City is built. Citizens (as well as journalists in particular) are under strict supervision and the slightest disturbance is sufficient to be transferred to the prison. Sharp is assisted by psychiatrist Hugo Strange and hires the armed forces of the rogue security firm TYGER Security to maintain order. The story for Batman starts when he, as Bruce Wayne, is sent to Arkham City after declaring his opposition to the facility in a press conference. Strange is aware of Wayne's dual identity, but he can escape from the Penguin and gets his gear back through an airdrop from Alfred Pennyworth, which allows him to turn into Batman and fight the facility from the inside. Much of the story also revolves around a strange disease called the Titan formula that has infected Joker, and a secret plan called Protocol 10. Other famous characters from the franchise that make an appearance include Catwoman, Mr. Freeze, R? 's al Gh?l, and Clayface. The game has an open world environment for Batman to explore with secondary objectives and paths next to the main storyline. Just like the first game, Batman has access to a large amount of melee fighting moves that can be chained into combos and throws, as well as a large arsenal of gadgets used in combat, to solve puzzles, or to travel through the environment. Most situations offer the choice to go head-on, or move more silently by gliding and using stealth. At the start of the game Batman has all the gadgets from the first game, with improved abilities, and new ones become available later on. The improved abilities include the use of the grappling hook while gliding to reach higher areas, the line launcher that can also acts as a tightrope with a flipping mechanic to launch another line in a different direction, built-in boost and brake for the Batarang, and the ability to track signals through the cryptographic sequencer. Some of the new gadgets allow Batman to freeze enemies and water with ice grenades, detonate explosive and jam weapons with a disruptor, confuse enemies with smoke, and power electrical equipment and shock enemies with a taser. Still present from the original game is the Detective mode, a form of augmented reality where evidence and enemies become clearer. It is now used more often for forensic puzzles, for instance to trace the origin of items. Batman also has access to a criminal database. For the secondary quests he often has to collect trophies hidden by the Riddler, with 440 challenges in total. In addition to Batman the game can also be played as Catwoman for a series of missions in the main campaign. She is enabled by entering a single-use code provided with each new copy of the game for the Xbox 360 and PS3. For the PC it was slip-streamed into the game right away. Catwoman has a different, more acrobatic fighting style with bolas, whips, and claws. The Detective mode is called Thief Vision for her and allows her to steal items. Some secondary puzzles can only be completed as Catwoman. The console versions support a stereoscopic 3D mode.